FragTrack and ParticleTrack are codes developed by Protection Engineering Consultants (PEC) to classify, track and describe fragments and particulates observed in high-speed testing videos. Such data processing capabilities are critical for data measurement from a wide scatter of test scenarios, particularly where manual data collection is either impractical or impossible. The codes provide a pragmatic solution that addresses a historically difficult problem – specifically, to acquire data from high-speed video, automatically, and to bridge the gap between what are often qualitative observations to highly-reliable sets of quantitative data. 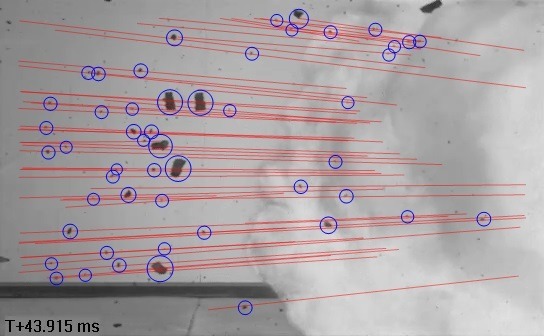 This is achieved through the judicious application of computer vision algorithms, robust video and image pre- and post-processing, temporal filtering, and tracking techniques, all of which serve to identify and classify debris candidates, track them throughout their appearance in high-speed video scenes, and ultimately quantify the debris(size, aspect ratio, trajectory, velocity, etc.). (1) Frame data is filtered, normalized, and image gradient magnitudes are calculated for later use as a metric in the detection. (2) “Blob” detection identifies areas which may contain a particle/fragment. These are further processed to yield an initial set of debris candidates. The process is repeated for all extracted video frames. (3) Following the calculation of local trajectories and subsequent culling of debris candidates, the global trajectories are calculated using frame data available for each fragment. Multiple frames are considered for this process, with the objective of identifying all frames in which a given debris candidate may appear. If certain requirements are met, the candidate is considered to be valid. Metrics, including direction, velocity, size, and aspect ratio, are then calculated and output (CSV and video). For more information on FragTrack, ParticleTrack, or how PEC can support your testing, modeling, and simulation projects, please contact Matt Barsotti.